Successfully Added Digital Camcorder 5.0M Pixel - 3.0 Inch LTPS and 8x Digital Zoom to your Shopping Cart. For recording all those moments that you want to remember, this Chinavasion wholesale 5.0 megapixel Digital Camcorder with 8X digital zoom and a 3 Inch LTPS LCD screen is a wonderful choice. For extra long recordings, you can use up to a maximum 4GB SD/MMC card. 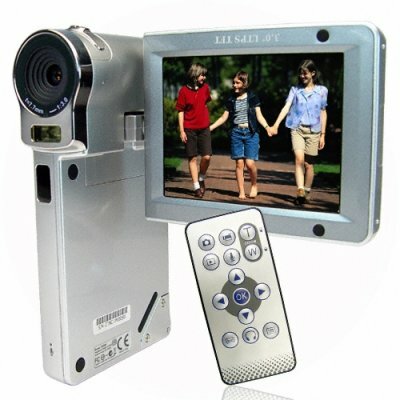 This Made in China Digital Camcorder can also be used as a PC camera, or as a Digital Camera. Note on Interpolation: Please note that this camcorder takes images in sizes equivalent to 12.0 megapixels. This is through a software resizing process on the camcorder called interpolation. The image sensor of this camcorder has a native resolution of 5.0 megapixels.